The Queen’s Christmas Broadcast was the most watched TV programme on Christmas Day, overnight viewing figures show. Michael McIntyre’s Big Christmas Show on BBC One was the highest rated programme on a single channel, with 6.1 million viewers tuning in. The Barb figures show a continuing decline in Christmas TV viewing – 7.6 million watched the Queen last year. Overnight figures include people who watched a programme live or on catch-up on TV before 02:00 GMT on 26 December but not those watching on-demand services on smartphones and computers. 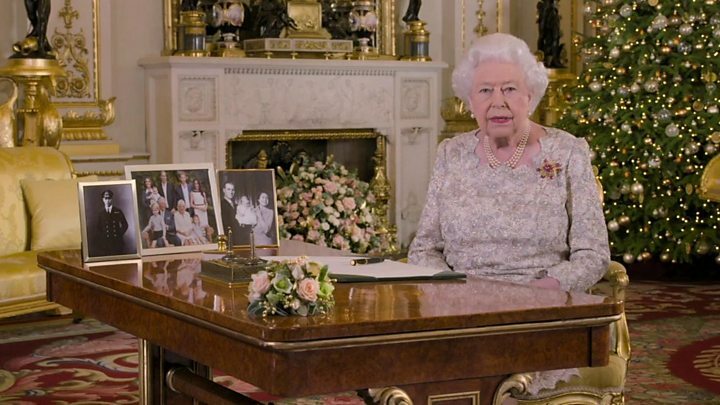 The Queen used her Christmas broadcast to say that the Christian message of “peace on Earth and goodwill to all” was “needed as much as ever”. 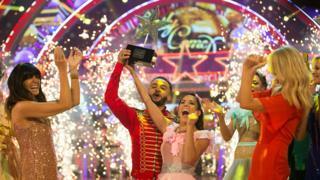 The top five most-watched list included three other programmes shown on BBC One – Strictly Come Dancing’s Christmas special, historical drama Call the Midwife and the 2016 live action remake of the Jungle Book. The BBC may have, as usual, dominated this year’s ratings – but traditional TV viewing on Christmas Day is falling significantly. Ten years ago, Wallace and Gromit: A Matter of Loaf and Death was watched by an overnight audience of 14.3 million people. That’s more than double the number who watched this year’s highest rated programme, The Queen’s Christmas Broadcast. Even solid performers like Mrs Brown’s Boys lost large numbers of viewers compared with 2017. The comedy is down by more than 2 million year on year. The growing impact of streaming services like Netflix and Amazon is undoubtedly partly to blame. It’s likely that a lack of “event programmes” that can deliver really big in the way that shows like Only Fools & Horses did, has also contributed. But the most significant factor is probably a very straightforward one – people’s viewing habits are changing, and TV viewing on Christmas Day is becoming less important to us. Of course these overnight figures are a snapshot, and some shows will add millions more through catch-up services. So the overall picture won’t be clear for another week. But while the traditional image of families settling down to enjoy a variety of festive TV together is still an accurate one for many, for more and more people TV is no longer the automatic choice on Christmas Day. Audiences for Christmas Day have been falling in recent years and no programme has attracted more than 20 million viewers since 2001. The single biggest Christmas Day TV audience was recorded in 1989 when 21.8 million watched the UK premiere of the film Crocodile Dundee. The official figures do not include repeats – ruling out the late-night episode of EastEnders broadcast on Christmas Day 1986 featuring “Dirty” Den Watts handing divorce papers to his wife Angie. The programme had an audience of 30 million if a repeat on 28 December is included but only 18.9 million watched it on 25 December.